The most awarded sauce in the "D"
The 2 most awarded bacon sauces in the world toghether in this dynamic duo! Classic Beer Bacon Chipotle and our NEW Beer Bacon Chipotle w/Scorpion together as one awesome package! 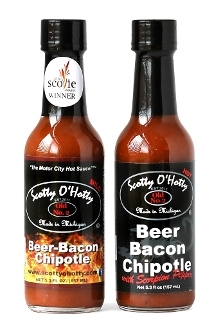 Copyright © 2012-2019 Scotty O'Hotty Hot Sauce. All rights reserved.